A must-have for a home-gym and workout enthusiasts. Perfect for upper workouts, abdominal work, sit-ups, and push-ups. Shapes, firms and strengthens your back, abs, arm, chest and hip muscles. With ample padding and heavy duty steel construction, our sit up bench provides stability for simple exercises and is ideal for you to achieve the body you want. 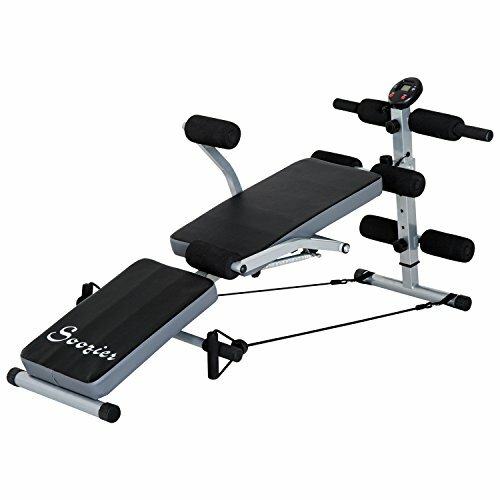 ✔ MULTI-FUNCTIONAL ABDOMINAL BENCH:This bench can be used as Sit Ups, Pull Up,Ab Bench, Arm and Leg Exercises and Weight Bench and dumbbell bench.It also comes with a pair of resistance bands and a spring expander which help in boosting your strength training. ✔ COMFORTABLE DESIGN:This arc design bench cushion coverd by PVC leather provides more support for your spine and the hollow part of your back,giving you a more efficient workout. Equipped with non-slip foam padded handles, our bench secures your ankles and legs for safely. ✔ WAIST SUPPORT INCLUDED：A pair of waist support is included to help beginners or other exerciser to train with more ease and provide more protection to body. ✔ STURDY MATERIAL& ADJUSTABLE HEIGHT：This sit up bench boasts a heavy-duty steel framework that is guaranteed to withstand a weight of 240 pounds. Additionally, 4-level thigh support adjustment to fit with most people's requiremnet. ✔ LCD MONITOR TO TRACK YOUR EXERCISE: LCD monitor tracks Time,Count and Calorie so you can arrange your exercse resonably.